The agenda and meeting handouts have been posted. View them here. 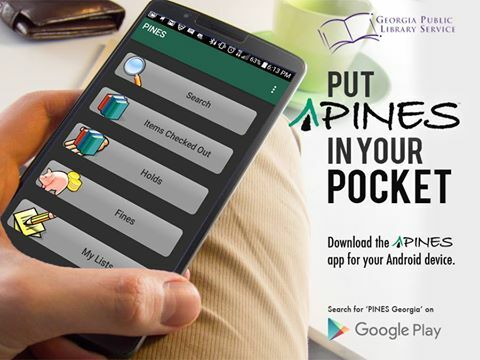 We are pleased to announce that the first version of a PINES Catalog app for Android phones is now available for download through the Google Play store! The PINES System Administration team will be performing hardware maintenance on our servers beginning at 9:00 p.m. tomorrow night, Wednesday, February 8 for an estimated 2 hours. All PINES services including the online catalog will be unavailable during the downtime. The PINES team will be performing a system upgrade beginning on Saturday, January 14 at 6:00 p.m. The system will be back online at Tuesday, January 17 at 6:00 a.m. If possible, we may be able to bring the online catalog online sooner, for the benefit of patrons accessing the site through a web browser. The next Evergreen International Conference will be held in Covington, Kentucky on April 5-8, 2017. We encourage PINES Directors, Executive Committee Members, Circulation Managers, Local Administrators, Catalogers, and all other PINES library staff to consider attending. PINES staff will be upgrading to the 2.11 version of Evergreen over Martin Luther King, Jr. weekend in January 2017. The next PINES Executive Committee Meeting will be held on Wednesday, September 21. Click here for additional information and relevant documents.